Artist Paul Reif works on one of his creations. “The Cascades” by Paul Reif. The Champaign County Arts Council will hold a reception in honor of the late artist Paul Reif, in conjunction with Art Affair on the Square. The reception will be held on the eve of the Art Affair, Friday, July 17, from 6 to 8 p.m. at the Arts Council Gallery. The public is invited to attend. Reif’s artwork will be on display at the Arts Council Gallery, 119 Miami St., Urbana, from July 13 to July 24. 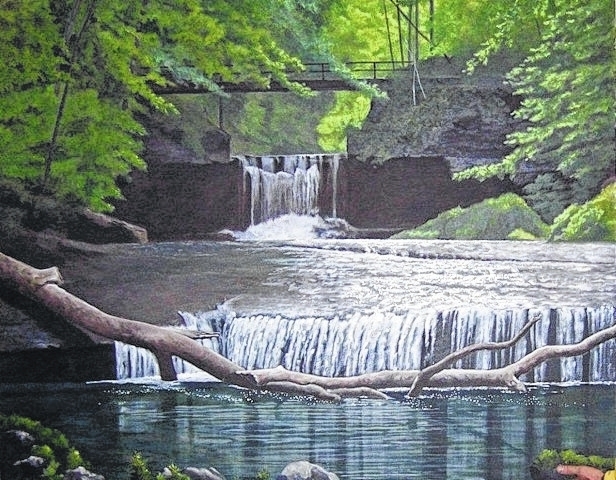 Regular office hours are Monday-Friday, 9 a.m. to 1 p.m., however, the gallery will be open for the Art Affair on the Square on Saturday, July 18, from 10 a.m. to 6 p.m.
Paul Reif was a self-taught painter who picked up the brush when he retired from Wright-Patterson Air Force Base in 1990. 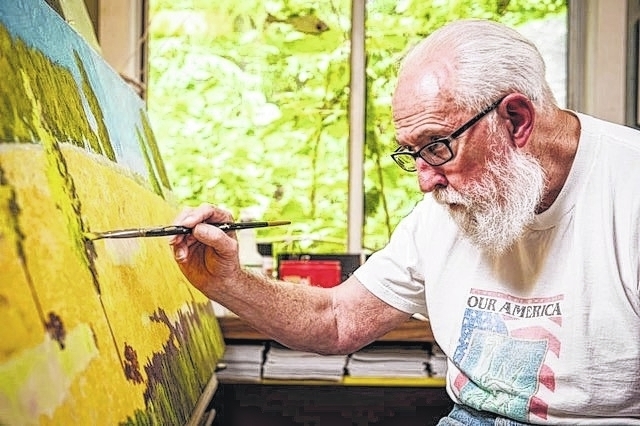 He was a member of the Champaign County Arts Council, the Western Ohio Watercolor Society, the Springfield Museum of Art and the Ohio Plein Air Society. For more information on the exhibit or the reception, contact the Arts Council at 937-653-7557.